Hello again, fellow casino fans, it’s Dave Monk here with another in-depth casino review for you. I’m one of the editors here and resident video slots “expert” (which means I play a lot of ‘em!). Today I thought I was going to lose my mojo, but it turns out I only lost the “M”, because I’ve found myself enjoying gambling at PlayOJO.com. Now, you know me – I know what I like and I like what I know. However, PlayOJO have hit the market like a breath of fresh air, and they are staking their reputation on being the UK’s “fairest” online casino. The first thing to say is that PlayOJO.com looks great! They’ve gone for a really simple, bright and clean look to their site and it’s a pleasure to navigate. 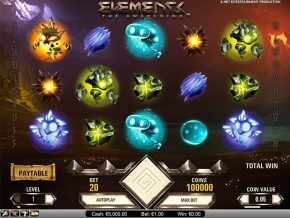 It seems to me that these newcomers have really done their homework about what works well for a casino website. The uncluttered layout and lack of silly gimmicks means you get to the action really quickly and don’t have to waste any time getting down to some play. They’ve also gone all out to put together a great search function, and you soon realise they needed to! This casino has over 2,000 games at time of writing, and they claim they are all selected by PlayOJO, not just cut and paste the whole catalogue of a few software providers. I lost count after recognising work from at least 10 different software houses, and all the games do seem to have good quality – very little “filler” here. So far, so good! If you’re a slot maniac like me you’ll be rubbing your hands with glee as there are over 1,000 to choose from! There are also over 20 progressive jackpots including Hall of Gods, Mega Moolah, and more classics – at time of writing the combined jackpot offering on the site was a staggering £34 million! On the standard slots front there are loads of A-list titles, including Guns n Roses, Starburst, Book of Dead and many more. Everything is available as either play-for-free or play-for-real, giving you a great chance to get to know a new game before using your account balance on it. Top job, Ojo! If you’re a fan of traditional casino table games then you’re well catered for here. I LOVE the fact that the search function lets you instantly bring up only blackjack play, only roulette play, or only card play, for example. These means it takes only seconds to find a table and get your game on. 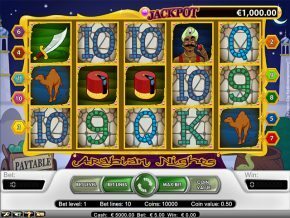 Really unusually for casinos these days, PlayOJO.com has a nice selection of video poker games – I find these perfect for a relaxing flutter and it’s good to see them being supported. Outside these main headings you won’t find much else going on in the way of table games, though, so if you’re a fan of craps, baccarat, or even simple hi-lo or scratchcard-type games there’s nothing for you here. 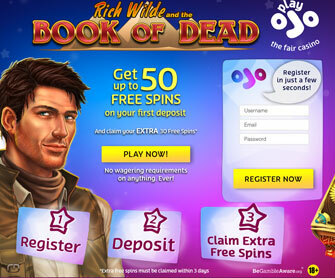 I know live casino gaming is growing in popularity, but I didn’t know that PlayOJO.com was its spiritual home. There are… wait for it… 66 live casino tables here! That’s a phenomenal amount, but what impresses me most is the range of styles on offer. As well as your standard live croupier games being played on a casino-like set, there are also whacky variants where the dealers are against a green screen, meaning you can choose the background! Roulette under the sea, anyone? Go for it! Again, by cherry picking from a range of providers PlayOJO.com ensures quality, and there’s a great mix available. The tables are dominated by blackjack and roulette, but there are handful of hold ‘em and baccarat live options available. This large number of tables means it’s easy to find a space to “sit” at, and there’s a great choice of “look and feel”. This makes PlayOJO a great place for newbies to the live casino experience to get their feet wet. As you’d expect from expert providers like NetEnt and Evolution, everything ran very sweetly indeed, and the quality of the streams was consistently excellent. Again, the search feature and the presentation of everything makes playing easy. Top job, guys! They’ve got all the bases covered for you here. If you’ve got a “big screen” phone or tablet, just head over to the site and play in the browser – you’ll automatically see the mobile optimised version without having to tweak any settings or do anything different. Perfect for sausage-fingered tech dummies like me! What I really like, though, is that PlayOJO.com had developed a fully-featured mobile app. This, in my opinion, is the best way to play on a smaller screen because it’s been perfectly designed with that in mind – and the games look really excellent, filling the whole screen and giving you a “proper” gaming-on-the-go experience. The other benefit of the app is that you get simple touch access to your account details, special offers, VIP access (if you qualify) and more. Simples! Ok, so now down to the nitty gritty. If this PlayOJO lot are so “fair”, how does that actually work? Well, up front they will tell you – no wagering requirements, no holding on to your winnings, everything paid in cash. Right, now you’ve picked yourself off the floor, let me just spell that out again – because it really is a unique proposition. Win money off a free spin? Keep it… even withdraw straight away if you want! Not only that, but they also offer a loyalty scheme called OJOPlus. Whenever you bet, they’ll give you a % back as a loyalty payment, win or lose. This can range from small (0.06% of your stake) up to rather generous (0.6%) of your stake. You can transfer this free money to your account any time, and either play with it or withdraw it. Wow! Now with all this generosity I wasn’t expecting to find a welcome offer – why would they?! But do you know what? I dug around, and just for you dear readers I found one! Simply deposit £10 or more for the first time and receive 1 free spin on Book of Dead for each £1 you load, up to a maximum of 50 free spins! Even better, if you win you get to keep it all as cash! No wager through requirements or any other restrictions. You really can’t say fairer than that. So here’s where it often goes wrong, and to be honest I wasn’t expecting much given how generous PlayOJO.com are with their treatment of your winnings. However, I’ve been consistently impressed. First off, the help section on the site is very well done. Simply laid out, great search facility, even some introductory how-to videos to guide you through account opening, deposits and withdrawals, how to play, and more. A model of clarity that other casinos need to take note of! Live customer support isn’t available 24 hours, and there’s no telephone option. This is a little bit of a let down, and their opening hours of 6am to midnight UK time are ok. I would have liked to see them move those hours to 9am to 2am, say, but there we are. Having said all that, their live chat agents are among the quickest to respond and friendliest I’ve dealt with. These people have obviously been hired for their personality as well as their customer care focus. Nicely done, OJO. Depositing cash into your account is simple, and the rules are easy. They accept pretty much all the major pay options you can think of, including Visa, Mastercard, Switch and Maestro, PayPal, Skrill, paysafecard, Neteller, direct deposit from your bank account and more. Every payment method has the same straightforward requirements – minimum deposit is £10, minimum withdrawal amount is £0! PlayOJO.com don’t levy any processing fees at all – but check if your chosen payment method or provider does. Once you’ve made a deposit by credit card you can then get access to the “quick deposit” feature available from the game pages. Just click this icon, put your card’s CVV number and amount in and ta da! Instant top up without leaving the play screen. Excellent! Other than the deposit minimum there are literally no other limits. No maximum withdrawal amount, no monthly ceilings to hit. Nada. Zip. Nothing. If you win a £1 million progressive you can can take it all. This makes PlayOJO.com a very attractive casino option for high rollers. I really, REALLY like PlayOJO.com. They tell you they are the fairest casino, and then back it up with no play-through requirements, no payout limits, no fees. 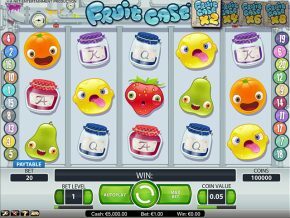 I can’t see a reason why you wouldn’t deposit £50 here and grab 50 free spins that you can actually withdraw the winnings from! Add to this a great site design, large range of games to play and good support features and you’re on to a winner.